The requests for special re-handling clamshell buckets that are received by KINSHOFER’s Department for Custom Solutions, focus on best quality and longevity. The regular re-handling clamshell buckets of the C-Series are indeed very durable and designed for excavators from 18t/39,600 lbs to 80t/176,000 lbs operating weight. However, more and more customers need even tougher constructions for the extreme demands on their sites. This has led to the heavyduty option which means, that they can get a bucket constructed with special reinforced shells for bulk material — in the excavator class with an operating weight of 25t/55,000 lbs to 40t/88,000 lbs this is the C40HD. specialist aggregate handling and recycling companies has continued expanding its modern fleet of plant with the purchase of a new Komatsu PC 360 LC fitted with a new KINSHOFER C40HD-175 rehandling clamshell. The clamshell was delivered and installed by KINSHOFER’s independent dealer for the North West, MTK (Breaker Hire and Sales) Ltd. 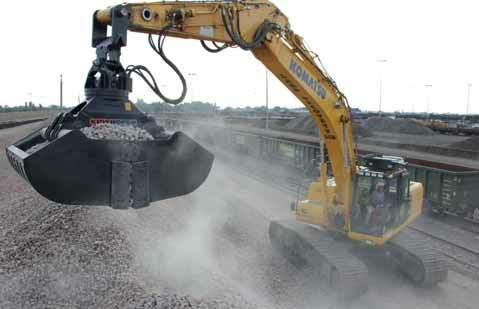 The Heavy Duty clamshell, which has a 2.1m3 capacity, was specified with additional bolt-on horizontal and vertical wear blades to help reduce wear caused by material abrasion, a heavy duty 360o continuous rotation system and then fitted to the dipper end of the Komatsu PC 360 before being deployed at a Network Rail Recycling site in Cambridgeshire. Among the key features of the C40HD clamshell is the wide pitch PCD ‘slew ring’ type rotation device for increased strength and stability, the use of high-strength impact-resistant materials which contribute to a low overall weight of the grab and the ‘flat bottom’ closing curve which prevents damage to railway wagons, boats and lorries. Bolt-on reversible horizontal and vertical wear blades protect surfaces vulnerable to abrasion, but also ensure rapid down time when being turned or replaced. KINSHOFER offers two more special re-handling clamshell buckets in this operating weight class, the C40VHD with two vertical cylinders as opened or closed version. Due to the closed shells, the latter is ideal for very fine-grained loads (e.g. fertilizer). Both types are constructed with integrated rotation, sealed swivel and bevel, a rotary feedthrough and with a motor, which is accessible directly. An integrated non-return valve guarantees the security of the load. Their excellent digging characteristics are the result of high closing forces due to the two vertical cylinders. The integrated rotation enables precise positioning. Long life is ensured due to the use of 500 HB steel in the manufacture of cutting edges. Their shell back walls (8mm/0.31in, HB 400) also resist highly abrasive materials. Bearing points with specially coated bushings and hardened pins are other details that underline the quality and longevity of KINSHOFER’s special re-handling clamshell buckets.